Trump was at CPAC (Conservative Political Action Conference) last Friday. No surprise there. 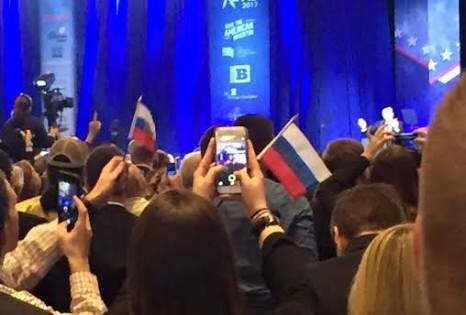 There was flag-waving at this Good Ol’ U S of A event. Again, no surprise. But did anyone have a good look at those flags? Yessiree minions! That’s the Russian flag!! It took a few minutes (enough for some photography and social media) before CPAC officials noticed the problem. You know. Flag waving. It’s a constitutional right or something, isn’t it? Word is, the flags were handed out by two protesters dressed just like all the other Conservatives there. How devious! Because we all know only the extremists/criminals/uneducated/uncivilised/unpatriotic/ etc would dare defy Hair Fuhrer (thanks to Shiri for that name). Maybe the aides should add The Big Bang Theory to Trumps “Calm Down Time”. Never before have we needed a spin-off so much.